Availability of too many chatbot development platforms, low chatbot development cost, ease of integration with a messaging platform like Facebook Messenger, Slack, Telegram, to name a few, and rising chatbot demand from consumers are some of the signals that the time is ripe of chatbot adoption. Wondering what benefit it would bring to your business bottom line? How would it make you expedite your customer acquisition strategy? Find your answers with us. Messaging platforms like Facebook, WhatsApp, etc. are already available to your audience. Hence, with AI chatbot, you don’t need to invest much in reaching out to them. With messaging platform touching new highs, you don’t need to promote your chatbot. All that you need to do is to create an engaging conversational chatbot harnessing the capabilities of NLP (Neuro-Linguistic Programming). By integrating your chatbot with existing messages, you are not competing with anyone, instead offering a better way to your customers or prospects to connect and engage with you. Customers need and appreciate support while shopping in-store or online. Hence, if your chatbot can do the same, it will make a significant improvement in your customer acquisition endeavour. For instance, if shoppers are on your eCommerce website, your chatbot can help them find the best deals in their price bracket. It can answer their queries, help them register, make payment, update shipping address and so on. Likewise, similar support you can provide to customers who are interested in knowing the status of their delivery. So, a chatbot application comes with multiple benefits - it raises the level of customer satisfaction and cuts down the cost of customer service. A chatbot keeps your business on and makes your products or services accessible to customers 24/7. More hours translate into more customers and better customer service. Thus, chatbot development investment can have a lucrative return. The impression that you create with your customer experience is not going to confine to them; rather it will spread through word-of-mouth to bag more benefits for you with repeat sales and customer service. The saving in term of human resource is again an understood fact. With more and more millennials joining your consumer-base, you can’t think of surviving with passive customer interaction alone. Yes, don’t expect customers to initiate the conversation. Whether it’s engaging with a prospect or an existing customer, resorting to proactive communication makes a significant difference to their experience with your brand make them feel special. How does the user-engagement affect the business bottom line? Well, the answer is in many ways. But the most significant one is regarding quality lead generation. What makes it so? Well, it helps you better understand the requirements of your prospects and offer the right solution that will help them gain more competency and serve their customers better. So, it maximizes qualification and nurturing of leads. 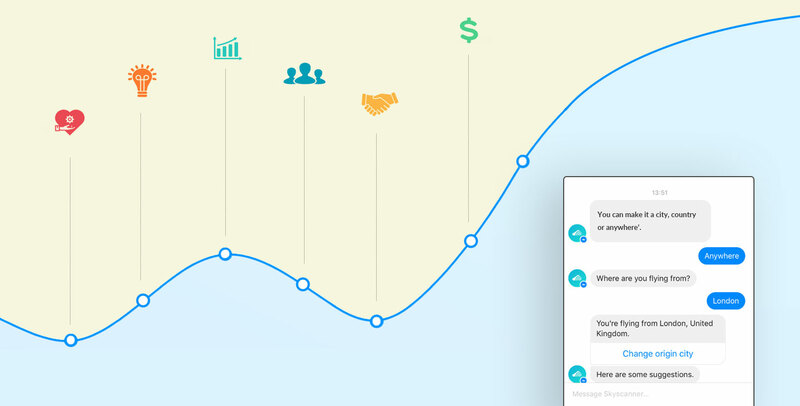 You can further maximize the chatbot ROI by connecting your chatbot with your CRM (customer relationship management) platform. Gaining business intelligence has got a lot easier with AI chatbot and machine learning. You can learn the trends, decode the past conversation with customers to know about their choices and interests, see what is making them unhappy and much more. All these data insights can be utilized to improve the business processes and innovate the product or service line in tune with what is required. Integration of a chatbot with your business website helps to capture more opportunities, transforming the customer experience, reducing the cost of business operation and making a difference to your brand’s reputation and presence. However, you shouldn’t underestimate the user experience. You should focus on creating a conversational AI chatbot that can do context based talking.